Hibakushaten, with the assistance of world heritage sites Kinkakuji and Ginkakuji, will exhibit in Kyoto this summer at the Shokokuji Jotenkaku Museum. The work of six Japanese photographers, depicting the damage caused by nuclear radiation has resonated loudly throughout the world. In the lead up to the seventieth anniversary in 2015 of the nuclear bombing of Japan, Hibakushaten has committed to promote the damage inflicted by nuclear radiation through collaboration with world heritage sites and the development of the concept, joint value of physical heritage and the heritage of victims’ memories. Kyoto city was a candidate selected by the US military for nuclear bombing during WWII. However, Kinkakuji, Ginkakuji and other world heritage sites have not escaped the damage from radiation. We believe we must clean the world of nuclear pollution and create a world without nuclear victims. Through achieving such a world the photographs of nuclear victims will then become a memory of a past world we must not forget. Mr Raitei Arima, chairman of the Hibakushaten @ Kyoto executive committee and chairman of the board of directors of the Kyoto Buddhist Organization states that the sole of Buddhism dictates that we must protect clause 9 of the Japanese constitution and we must aim for a world free of nuclear weapons and power. Mr Arima made the decision to exhibit Hibakushaten at Shokokuji Jotenkaku Museum immediately after viewing the photos of Hibakushaten in February. depicting Shokokuji’s Kinkakuji and Ginkakuji temples (temples within temples) with two Japanese female victims of the nuclear bombings. 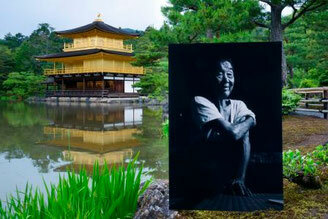 The temple photos have been taken by renowned photographer Mr Katsuhiko Mizuno (resident of Kyoto). Mr Mizuno and Mr Itetsu Morishita (Hibakushaten photographer) have known each other since meeting at the Tokyo College of Photography. The deeper meaning of combining their photos resonated with them both. After completing the photographic work Mr Mizuno said the following. 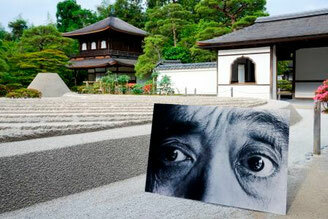 “I initially thought the photos of the nuclear victims did not mix well with the gardens of Kinkakuji and Ginkakuji. However the lives of these victims are depicted in their photos, and I began to feel that these women were actually standing in the beautiful temple gardens”. A sharp pain runs through her body constantly, causing her to distort her eyebrows. to mark the 20th anniversary of the Earth Summit held in 1992.
organised by citizens’ groups the world over. when I worked as a home carer. if I could, to people who suffered at our hands”. They passed away with unresolved feelings of guilt. Following the path of Ittetsu Morishita, who has fallen ill and had to discontinue his work, I would like to start the World Hibakusha Exhibition (No More Hibakusha) with words of apology. I have many apologies to make. Apologies for Japan’s war actions that inflicted terrible suffering on so many people. Apologies for not having been able to prevent the nuclear testing, the wars in Vietnam, Iraq and other parts of the world and the use of depleted uranium bombs, which created many more hibakushas worldwide, despite our experience of Hiroshima and Nagasaki. Apologies for allowing the construction of nuclear power stations under the name of “Peaceful Use of the Atom”, and for causing the Fukushima Daiichi accident which scattered radiation worldwide. Wishing to extend clear words of apology as someone from Japan, I would like to introduce the World Hibakusha Exhibition (No More Hibakusha) as an opportunity for people to look at what is happening and to think about the future. We must never waste the lessons from the sacrifice of hibakushas’ lives in Hiroshima, Nagasaki and the world over.